Over 100 varieties and flavors to choose from. for even distribution of flavor extracts, ensuring consistent taste and quality. Established company, roasting coffee for over 28 years. Customer has immediate local access to roasting plant and cupping room. producing a mild-flavored bean that is considered the world’s finest. Caffeine content is naturally 50%-60% less than canned robusta coffee. The taste is so remarkable it is even good COLD. All Buckmaster decaffeinated coffees are 97% caffeine-free. AIR ROASTING MAKES A DIFFERENCE! Much like a hot-air popcorn popper, high temperature air flows around the coffee beans, roasting and mixing them thoroughly. Smoke, dust and chaff are carried away by the forced hot air. The coffee produced is clean, without any ash or smoke residue commonly found in the cylindrical roasting method. Buckmaster’s unique roasting process produces distinctive and exquisite coffee. You can taste the difference! is a growing coffee company that started in a small town in Southern Oregon. With quality and service as our main focus, we can ensure that you receive the best. Once you experience the wonderful taste of Buckmaster gourmet coffee, try experimenting by making your own “personal” blend. Select some of your non-blended favorites and mix two, three or four together to get just the right taste for you. Begin with clean equipment and fresh water. 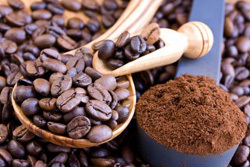 Use one or two level tablespoons (suit your taste) of finely ground coffee per cup. Be sure you grind the coffee to match your brewing system. Example: Fine grind for cone filter—Auto Drip for basket filter—Coarse grind for French Press, etc. For the record, ½ cup or 4 ounces by volume, is what the average consumer uses for a 10 cup brewing system. Of course, others use more, but very few use less. Coffee roasted to order and delivered 12-24 hours later! Better coverage and service based on past performance—GUARANTEED! Unique equipment! 1. 40% less inventory! Air Roasted! Sweeter, cleaner coffee. 100% high grown Arabicas. 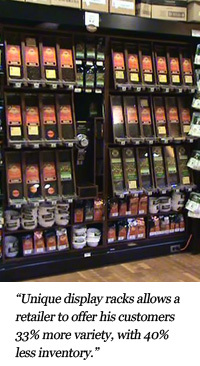 Full line of Packaged Coffees, Syrups, Espresso Beans, Filters, etc. Special events participation: i.e. Golf Outings, Fund Raisers, etc. Specifically designed for your store and event by your local roaster. Buckmaster Gourmet Coffee is a Northwest roaster, keeping the dollars in our marketing areas. Even Roasting Coffee beans roll through fire heated air rather than the unevenly heated drum method. You enjoy the supremacy of convection roasting. Extremely Flavorful Taste Our Fire Heated Air enclosed system is a controlled environment resulting in consistently excellent taste that’s never burnt or bitter. Dust and Chaff-free Coffee Our system removes all dust and chaff resulting in a clean and fresh taste every time. Buckmaster Coffee. All rights reserved. 2011.